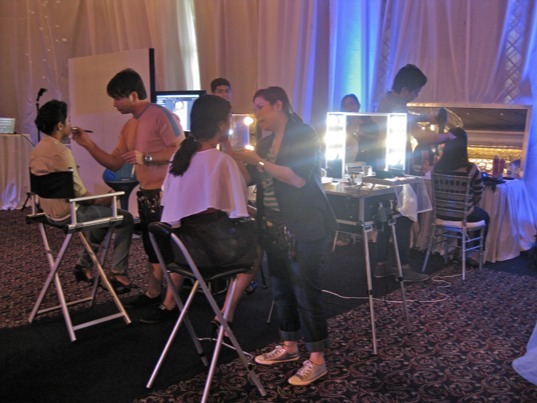 tonight we're missing the "engagement party" of close-up couples joey mead+ian king and rosanna ocampo+marco rodriguez. as typhoon megi/juan howls outside and its downpour causes traffic snarls everywhere, we think we'd rather be home safe and sound with the hubby and the doggy. too dangerous out there! scurry... anyhoo, last week we were one of the few who got the opportunity to try the new whitening toothpaste of close-up called white now. 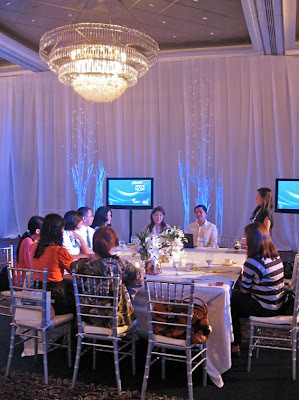 the rigodon ballroom of the peninsula manila was draped in sheer white fabric and decorated with everything white, silvery, and sparkly. here we are listening to the executives talk about this new development in whitening toothpaste. what makes it different is that the effect is immediate. as in NOW. as in right after you brush you see the difference. no need to wait two weeks. 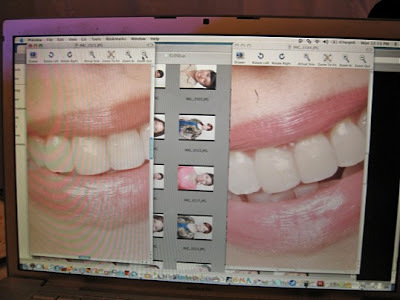 you get whiter teeth in two minutes! 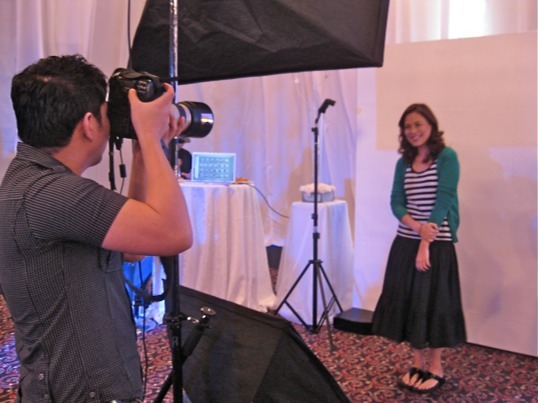 and to prove this, they set up a mini photo studio in the ballroom. that's to get your before and after shot. they also actually set up two sinks where we could brush our teeth! here are the summit gals getting their turn at the sink. in the middle is the close-up "promo girl" timing them. you have to brush for two minutes to get the maximum effect. then get your hair and makeup done before being photographed for the after shot. ok, for purposes of, er, science, we're going to show you our before and after shots. pero ngipin lang nga haha! on the left is before and on the right is after. after we brushed we didn't really see the difference. maybe it was the "romantic" lighting of the ballroom. but when they zoomed in on our teeth, wow! our teeth really became whiter! close-up white now has what they call blue foam technology, wherein the teeth are coated in white—so the results are instant! and yes they work on pustiso too! the whiteness is temporary, though, and will last for at least a couple of hours, depending on what you eat and drink. it's like makeup for teeth! close-up white now is available at supermarkets and drugstores for P65 (100g). Fash pack, ganda ng teeth!